The architectural competition for the Oude Dokken was the organ point of David Dhooge for Stéphane Beel Architects. After an international competition David led the design team of architects, consisting of Stéphane Beel Architects, Maat designers, BLAF architects, Denc! Studio, Onix (Nl) and Pauwels landscape. Of course, this could not happen without the particularly ambitious objectives of the city itself, the vision of the project developers and all the consultancy and advisory bodies involved. The cooperation with project developers Re-vive, Van Haerents and Van Roey was therefore very constructive. The design therefore won only through the totality, the coherence of architects, engineering firm and project developers. Everyone came to each other's ground to create a historical project together. The complexity of all tasks together, including designing a master plan with its own team, overseeing five architectural firms, maintaining contacts with engineering offices and project developers, (including contract negotiations, fees, etc. ), and at the same time designing some buildings of the site architecture, including two concrete residential towers (high-rise), David had by that time become an all-round figure who likes to take on high degrees of complexity and in open dialogue with all parties involved. Only by working together, across the borders of each field, such projects can be brought to a successful conclusion. Think partner in all of this was Wim Vandendriessche, supplemented by a very talented team of employees. Team: Re-vive, Van Haerents, Van Roey, Maes, Ingenium, etc. After an architectural competition in 2006, the team of Stéphane Beel Architects, led by David Dhooge, was appointed to make a master plan for the development of the station area post X in Berchem, Antwerp. The special physical preconditions due to the location near the Ring, Singel, Station Berchem and Deurne airport caused additional complexity. For more than seven years, David was the main person responsible for this project, working closely with the team of the project developer IRET development, VK engineering, Stedec and all the services of the city, including the then city architect of Antwerp. This led to a plan of which part has already been realized. The site has almost ten individual buildings that are passive construction. , all completed after a thorough study on the most compact, functional core. This years-long exercise led to an extensive knowledge of master planning, concrete office building infrastructure, technical knowledge concerning large and high façade finishes and the paired detailing of pass facades, sustainable office techniques, flexible layouts in function of potential buyers / tenants etc. A maximum flexibility was always used to convince potential tenants or buyers of the potential of the site or an individual building. The buildings are arranged around an elongated public square that is delimited by a striking awning structure, which is the backbone of the master plan. Here too, a clear, clear line that defines the plan. 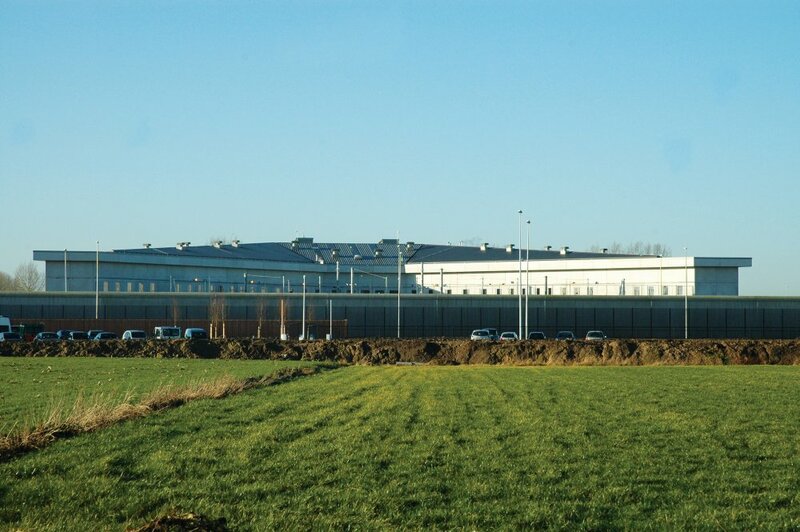 Following an international competition in 2009, David Dhooge and the team of Stéphane Beel Architects devised a concept for the construction of four new prisons at four different locations. Because the client (FOD Jusititie) assumed a classic, panoptic model (Ducpétiaux), there was unfortunately no room for maneuver to think about alternative forms of detention. Nevertheless, the specifications were all the more extensive, the complexity unseen and the challenge equally great. Aspects such as human safety, comfort, sport, relaxation, personnel, supplies, walks, courtroom, transport courts, easy way-finding, workshops and workshops etc all had to be combined in one clear design, with the emphasis on humanity, minimal walking routes, four seasonal gardens and a serene architecture in the form of precast concrete with staggered joints. We looked for one clear system, a design that has symbolic value in its simplicity and image, and that was also applicable to four completely different sites (inclined plane). terrain). The concept can be traced back to a clear schedule, the logo of which serves as signaling within the prison.